The cooler end to October, at least compared to what we experienced in the first two plus weeks of the month, have some of us pining for winter to set in full time, permanently. With that, the thought of what may, possibly, could, ultimately happen this winter is on some of your minds. As is usual tradition, our winter outlook tries to get to the bottom of the plethora of mysteries out there and comes up with a quantifiable expectation for what *may* transpire in the upcoming winter. Philadelphia's position in the transition zone between the milder influences of the Gulf Stream and the colder northern climes makes forecasting winter more "fun" and not necessarily one of higher confidence here compared to in Boston or in Minneapolis. This winter outlook highlights the usual players that make up the winter and what those typically suggest when factored together in an upcoming winter. First, the North Atlantic Oscillation (NAO): NAO is reflective of the state of blocking in the atmosphere based on pressure setups in the North Atlantic. Our cold season last year featured very impressive blocking in October, November, and in late February into March but largely was neutral to positive for the heart of cold season. This was reflected in the reality that winter temperatures ended up above average last year despite a colder than average November, February, and March (-NAO's typically yield colder conditions in winter). 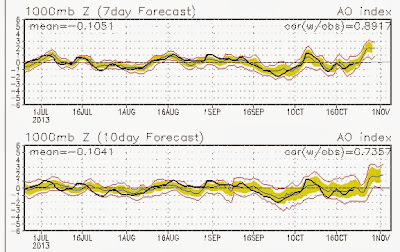 The NAO in October, historically, has a 60% tendency to have an opposite state for the winter overall (if the NAO is positive in October, it would be negative in the following winter six out of ten years). It's a decent, not great correlation. 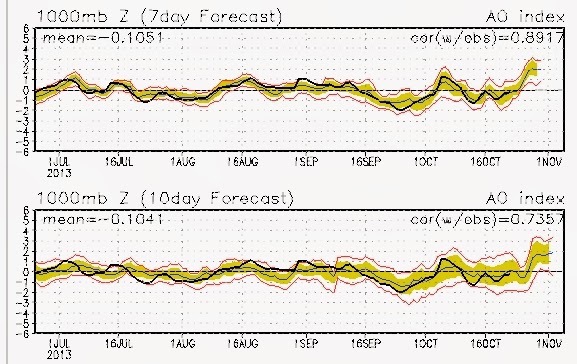 Based on where we're working towards this winter, the NAO should average out to negative for the month overall. Note the rather amplified pattern we've seen of late -- this typically is a sign of what may, at times, be a blocky regime through the course of winter. However, it may not necessarily be often enough to bring lasting cold through the heart of winter. 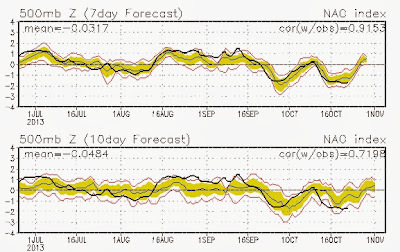 Second, the Arctic Oscillation (AO): The AO and NAO work in sync rather frequently (45 of the last 64 winters feature AO/NAO agreement). Last winter featured one of the exceptions to that pattern -- we had a rather negative AO regime through the course of the winter but the NAO did not respond in kind. An unfavorable NAO, combined with an unfavorable Pacific pattern, dumped the bulk of chill into Alaska last winter as opposed to down into the Northeast. There is a lower statistical correlation between October's AO and the proceeding winter AO (55% of agreement) than there is between the summer AO and the proceeding winter (60% agreement). 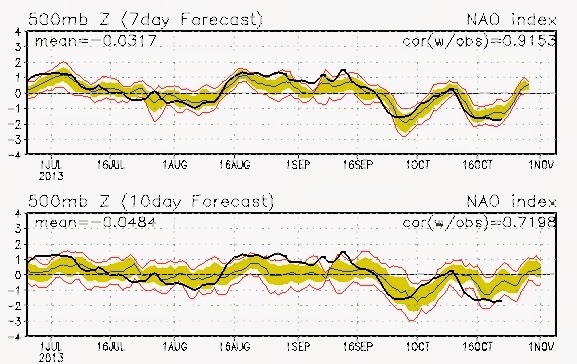 This summer's AO registered positive, while October for the whole will likely register positive as well. Positive AO status often yields milder conditions for us. 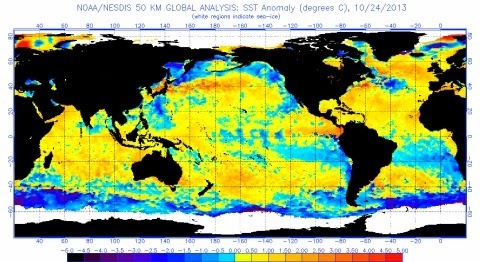 El Nino/La Nina/La Nada: The tropical Pacific does provide some steering and "big picture" for the following winter. The current neutral or "nada" look in the tropical Pacific is one that modeling suggests maintain for a chunk of the winter. We could drift into a warmer look in the Pacific late in the winter but it may not be in time to provide the corresponding atmospheric result that the warmer Pacific would provide. More important, the part of the Pacific that is warming (near South America) isn't the part you ideally want if you are a fan of cold and snow (east Ninos tend to produce warmer results for us than West). Neutral winters of late include last winter, 2003-2004, and 1996-1997. Two of those three ended up warm, with 03-04 the exception from a temperature standpoint thanks to strong arctic blocking. October's temperatures: There's a relatively strong correlation between October temperature and winter temperature over a long term period of time. The colder or warmer it is in October, the stronger the tendency it is for the following winter to follow suit. This October will end up above average on temperatures and in the warmer third of temperatures since 1940, which has a stronger than 70 percent correlation to above average temperatures in the proceeding winter. So...all of that put together...what happens this winter? We will lay that out this evening.